Experience a natural and amazing weight loss with Chaoji Garcinia Cambogia capsules which is a food supplement consisting of 100% pure and natural Garcinia Cambogia extracts with the infusion of nutritional whole fruit calcium and tripotassium citrate while excluding artificial ingredients, bindings, and fillers. Chaoji’s Garcinia Cambogia capsules are of the highest quality and contain 500mg of Garcinia extracts from whole fruits which makes I nutritional and suitable for weight loss management by speeding up the body metabolism process. Chaoji Farcina Cambogia capsules are a diet supplement capsules. Our chaoji capsules are made with natural ingredients. Safe, easy and convenient to use.They are derived from naturally occurring vegetable cellulose. Do not take for more than 12 weeks at a time. Do not Exceed Dosage. 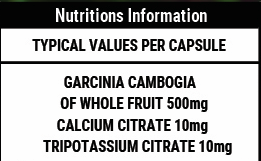 Garcinia Cambogia, Whole Fruit Calcium Citrate, Tripotassium Citrate.